Vasco Ribeira Casais is a multi-instrumentalist who plays around with traditional music in interesting and creative ways. In this new Omiri project, the former member of Dazkarieh and Seiva, has here pasted together traditional recordings, studio effects and dance tunes to hypnotic effect. 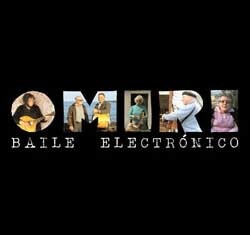 Omiri's 2010 Dentro da Matriz debut was described as “electropop, folk, world and country,” a bit of everything including some Lou Dalfin-like folk rock on the title track. And with a more instrumental focus generally. This 13-song second effort is in effect a solo project for Casais, the prolific and versatile bouzouki, violin, nyckelharpa and gaita player mixes (broadly speaking) folk and rap elements. On Baile Electronica he provides a new setting for corridinhos, chotiças, polcas, and other traditional dances. Mixing old recordings with his instrumentals and studio effects, Casais revisits some fine field recording material, dissecting and splicing, prompting a fresh look at what has been there all along. While in Dazkarieh and Seiva his bands featured a fairly straightforward, neo-trad approach, but here Casais has just fused the voices together with his own music, beat boxes, guitars, using the field recordings of Tiago Pereira, a collection of songs by mostly toothless but still tuneful elderly women, and whatever instrumentally or studio-wise comes to mind. "Glória" opens the set nicely and sort of turns a traditional tune into a form of rap. Two of the best tracks feature modern and traditional singers mixed into “duets”: “País de Colmena” (see video below) with the lead vocal of rapper Capicua, (Ana Matos Fernandez of Porto), and “Fado en Picadinho,” sung and with accordion by Celina da Piedade, of Alentejo, in another lively duet with the field recordings. Other standouts include “Polca Pórnografica,” which gets a bit rock-like, at moments; Chotiça de Fonte violin-based dance; “Faduncho Gaitero,” a showcase for gaita and percussion; and “Polca de Mariana,” with Casais on nyckelharpa and percussion.